The terminator is the dividing line between the illuminated and dark part of a planet's or moon's disk. 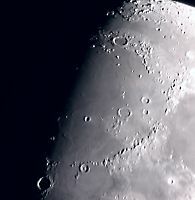 With a body lacking at atmosphere, such as the Moon, the terminator is distinct, although often broken up because of reflections from craters and mountains. Bodies with atmospheres have less well-defined terminators because atmospheres have less well-defined terminators because atmospheric scattering causes twilight.